I just LOVE a good taco salad, don't you? To make it even heartier I added some rice and, voila, this Taco Rice Bowl was born. This recipe is easy, healthy, kid-friendly, and budget friendly too! 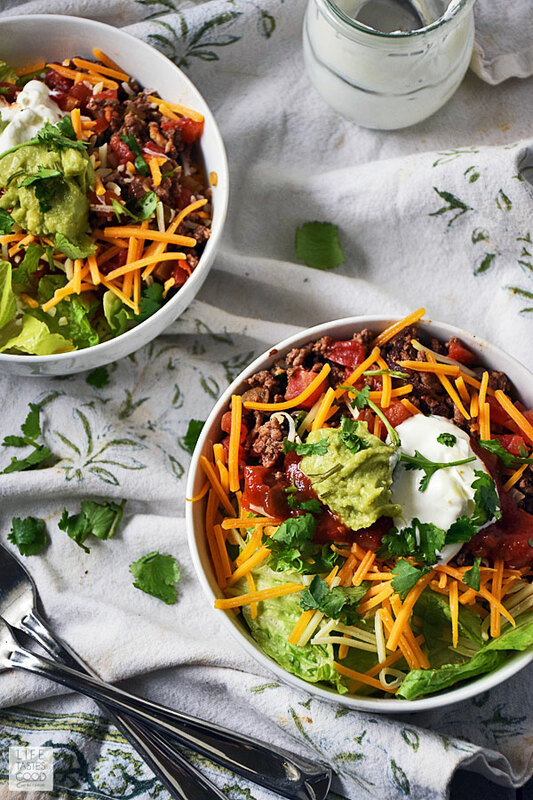 On the table in just 30 minutes, this Taco Rice Bowl is perfect for a quick meal any night of the week and leftovers make for a satisfying lunch too! 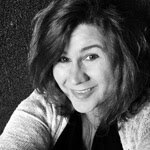 This recipe was developed one night when I was slacking and didn't have anything planned for dinner, so I searched the fridge and the pantry to see what I had on hand. I had everything for tacos except tortillas. I thought about making my One Pot Taco Pasta Skillet or my Easy Taco Pie recipe, but I was missing at least one important ingredient for each of those recipes. It was looking like taco salad, but Don (the hubs) needs something a little more substantial than salad for dinner. Lucky for me, he also LOVES rice, so when in doubt, I just toss rice in the recipe and I know it will be a winner for him. And this definitely was a WINNER! I'll be honest, I wasn't too sure about adding the lettuce to the rice bowl, but I went ahead and tried it seeing as we always eat tacos with lettuce or some kind of leafy greens. We love spinach in our Lime Chicken Soft Tacos! Anyway, I'm SOOOO glad I gave lettuce a chance in this rice bowl recipe, because with my first bite, I was pleasantly surprised at the taste! Don was mid-story when the first bite of this delicious Taco Rice Bowl hit my mouth, and I was so surprised by how much I enjoyed the flavor, I had to interrupt to let him know how I felt about it haha. I couldn't help myself! Rice bowls are super easy to make. I love them so much because of how versatile they are. In addition to this Taco Rice Bowl recipe, you'll want to check out my Vietnamese Bowl with Pork Meatballs over Rice. It's all the flavors of a Banh Mi in a convenient rice bowl recipe. Another one of our faves is my Greek Bowl with Meatballs over Couscous. Couscous is quicker to make than rice, making this bowl recipe extra easy! One of my most popular rice bowl recipes is my Asian Pork Meatballs over Coconut Rice. A unique combination of flavors you will want to make over and over again! Sometimes you can even eat the bowls like in my Stuffed Butternut Squash recipe! This is a seriously easy recipe that is on the table in just 30 minutes and that includes prep time! Prep is basically dicing up the onions and mincing the garlic and then measuring out the taco seasoning. If you have a favorite store bought taco seasoning you can use that, but I usually have all the spices on hand and just add a little of this and that until I get the taste just right for us. You can even use my measurements in the recipe instructions for the taco seasoning, but multiply them by 5 to keep it already mixed up in your pantry. I always say I'm going to do that, but then I get lazy and it never happens. You can use white or brown rice in this recipe. Brown is obviously healthier, but I had some white rice on hand so that's what I used. I have some issues with the texture of rice when made like most people make it. As a result, over the years, I've played around and came up with a recipe for rice that is more palatable for me. Basically, I use more butter than your typical rice recipe to get a creamier, fluffier texture to the rice. If you don't want to use that much butter, no worries, make the rice how you like it best. If you aren't a fan of rice, typically, you might want to try it my way and see if that works for you. In addition to using more butter than your typical rice recipe, I also use 1/2 water and 1/2 chicken stock to cook the rice. The chicken stock adds more flavor. You can use all water or you can sub chicken broth for the stock, but keep in mind, the rice will be less flavorful. Sear the ground chuck for more flavor. Yep, I sear my ground beef. I know it sounds weird and not a lot of people will tell you to do that, but I find it adds flavor if I put the whole chunk of ground beef in a hot skillet and let it get a nice crust on one side before breaking it up. Once it has a nice crust on one side, I add the onions, garlic, and the seasonings to the skillet and start breaking up the ground beef. Stirring to combine everything and saute the onions and garlic until tender and the beef is cooked through. This Taco Rice Bowl is perfect for a quick meal any night of the week and leftovers make for a satisfying lunch too! 4 tablespoons of my homemade Simple Guacamole or your favorite store bought brand. I like Wholly Guacamole when homemade is not an option. Rinse 1 cup of rice until water runs clear to remove any residue. Heat a skillet over med-high heat and melt 3 tablespoons of butter in skillet. Add 1 cup rice and stir to coat the rice with the butter. Cook until rice is slightly toasted. Add 1 cup water, 1 cup chicken stock, and a pinch of salt. Cover with a tight fitting lid. Reduce heat to mid-low and cook until most of the liquid is absorbed. About 12-15 minutes. Remove from heat and let stand, covered, for 5 minutes. Remove lid and fluff with fork. Give it a taste and add salt and pepper to your liking. While the rice is cooking, heat a skillet over mid-high heat and spray with cooking spray to coat the surface. Add 1/2 pound ground chuck all in one piece and allow to sear for about 3-5 minutes until a nice crust forms on the one side of the beef. Once the beef is nicely seared, add 1/4 cup diced onions, 1 teaspoon freshly minced garlic, 1/2 teaspoon chili powder, 1/2 teaspoon ground cumin, 1/4 teaspoon red pepper flakes, 1/8 teaspoon cayenne pepper, 1/4 teaspoon dried oregano, and 1/2 teaspoon kosher salt. Use a wooden spoon to break up beef and mix with seasonings. Cook until the onions and garlic are softened and meat is cooked through. About 5 minutes. 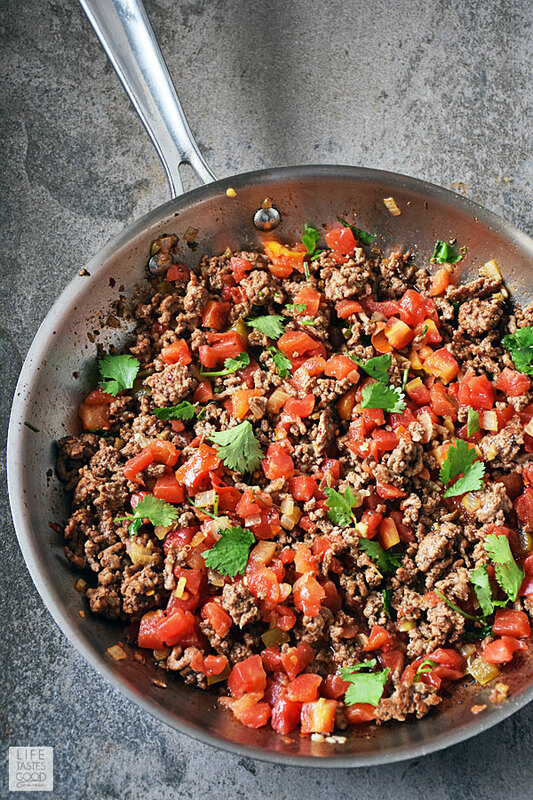 Once beef is cooked through, add 10 ounce can diced tomatoes with green chilies and stir to combine. 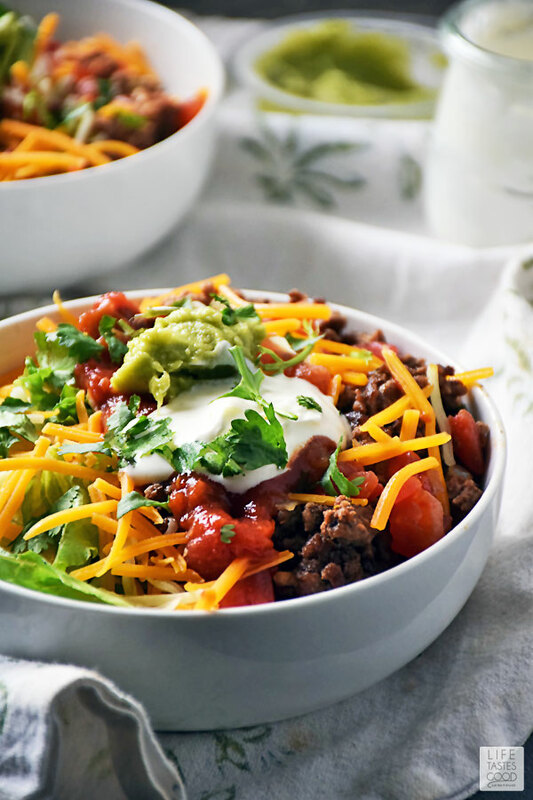 Reduce heat to low and keep warm until ready to assemble Taco Rice Bowls. Assemble bowls by dividing the rice evenly into 4 bowls. Top each with 1/2 cup lettuce, 1/4th of the meat mixture, 1 tablespoon salsa, 1 tablespoon shredded cheese, 1 tablespoon sour cream, 1 tablespoon guacamole, and freshly chopped cilantro for garnish. Serve and enjoy! I can eat taco bowls with rice over shells anytime. I use chicken stock too when cooking rice but I'm an olive oil fan. Gosh it's been WAY too long since I've had a taco salad, but I think I'll do a rice bowl instead! Yours looks fabulous. Basmati rice is my white-rice. 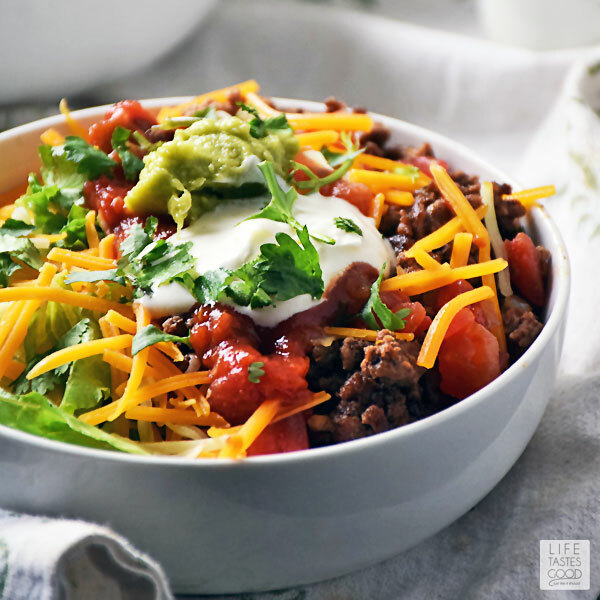 We love it and that includes my kids- taco night is always on a salad with rice for me, so this is my kind of rice-bowl recipe! This sounds so wonderfully flavorful and comforting. Can you use ground turkey breast instead of the ground beef? Absolutely, Teresa! Just sub the same amount of turkey breast in place of the beef. Enjoy! This is a brilliant way to please both hearty eaters and salad-for-dinner lovers ~ we've got one of each in our house! this is also great over cooked quinoa, and quinoa provides plant-based protein, so one gets the protein of the meat and of the grain. I eat with my minister and his family every Saturday after our Sabbath services, and Taco Salad or taco bowls are one of our favorite things to eat. All seven of their children love them, too (and number eight, newborn baby boy, will eventually love them :-) ). So happy everyone can enjoy this recipe!